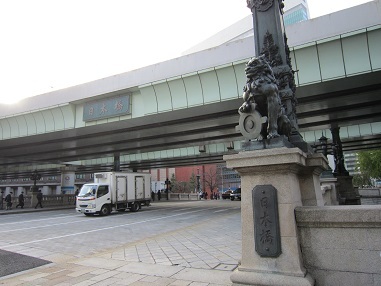 Nihonbashi was the starting point for five highways leading to the capital in the Edo period. Even modernroad signs with the distance in kilometers to Tokyo show the distance to Nihonbashi. In 1603,Nihonbashi was built and land reclamation began, and then Nihonbashi prospered as the center of of Edo’s economy and culture as a fish market. Nowadays there are lot of company headquaters. The most famous of these is is Nippon Ginko,or the bank of Japan, which prints Japanese notes. Other banks borrow money from the Bank of Japan, so it serves as a bank for other banks. Nearby is the Mitsukoshi Department Store, which started out as a kimono shop.